Ready to use from nature! Must not be mixed with water! 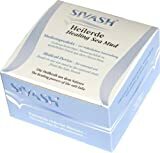 What is the SIVASH®-Healing Sea Mud? SIVASH-Sea mud is used for the peloid therapy in supportive treatment in the cases described above. The peloid therapy, the treatment with mud (silt), as a kind of balneotherapy, belongs to the most effective methods of natural healing. The main positive features of the peloid are the specific environmental conditions at the Sivash lake, especially the origin of marine silt in the highly concentrated pink brine and the fact that the peloid is present in the ready form in nature and has not be prepared.